and a choice of eight restaurants and bars. 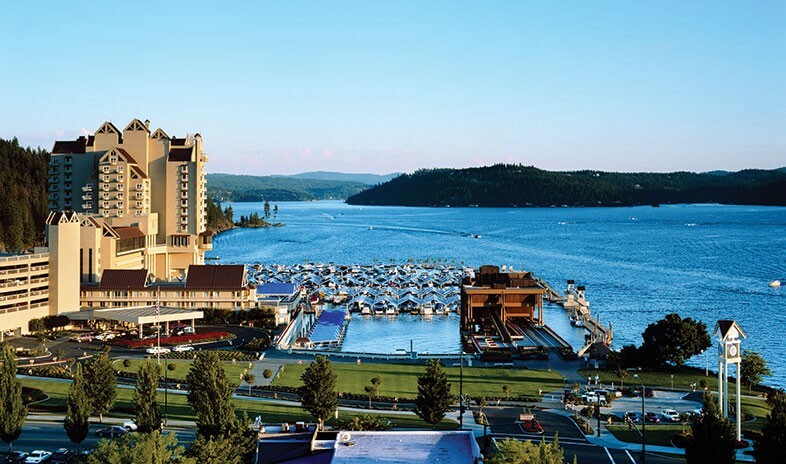 Aconsistent winner of the AAA Four Diamond Award since 1986, The Coeur d’Alene Resort fronts its namesake lake in its namesake town of Coeur d’Alene, Idaho. Just 35 minutes from Spokane International Airport and steps from the downtown area’s fashionable shops, bars, and restaurants, the resort offers luxury, serenity, golf, and lake-related activities to round out any business trip. Nearly all 338 guest rooms and suites focus on the lake and surrounding mountains. Inside, all impart an upscale residential feel, with every comfort of home and more. The same can be said for the eight bars and restaurants, whose offerings range from dockside American casual to authentic Asian bistro to the finest of Pacific Northwest cuisine. The conference facilities host executive retreats for 10 delegates as readily as corporate-wide assemblies of 1,200. The 28 meeting and event rooms add up to 32,000 square feet for every possible occasion. Attendees inevitably applaud the meeting services staff and team-building programs such as zip-line tours and Escape CDA, a timed game requiring cooperation and strategy to break out of a locked room. Adding a round of championship golf on the resort’s renowned course — featuring the world’s only movable, floating green — heightens any event. Golfers ride to the lakeside course six minutes away on mahogany water taxis. A dedicated tournament director and golf coordinators arrange every detail. Other recreational highlights include lake cruises on the resort’s own fleet of boats, tastings from the Northwest’s largest private wine collection, and tours of Casco Bay and the region’s largest private garden, as well as shopping, skiing, water sports, and hiking. Our event was a huge success. The event team was wonderful and very accommodating. Last minute requests were handled professionally and very timely. The entire crew was fabulous! This is an amazing resort with many options. The resort itself is top notch with a great choice of restaurants. The golf course is one of the top rated in the US with a floating green in the lake. There are lake cruises both brunch and dinner, along with a pirate cruise for the kids. Hiking trails, lake activities and a charming downtown area. The staff is top notch, one of my favorite hotels! I coordinate a business meeting here generally once a year. The staff is great to work with and are wiiing to work with our needs and expectations. Beautiful lakeside location with great dining and a wide variety of outdoor activities. The golf course is a real highlight especially the golf concierge service. I live right near this resort and it's one of my favorites. I have had several meetings at this resort because it is so close to our corporate headquarters. This place is top notch - the nicest people you'll ever meet work at this hotel - many of which have been working there for many years - I haven't been since their remodel so I can just imagine what's it's like now - if you go there, your stay wouldn't be complete without visiting their golf course - I can't even begin to describe it!